Ahhhhh, the picnic season is here!!!! Bring your blanket, basket, favorite snacks and drinks and take time in the country to relax. 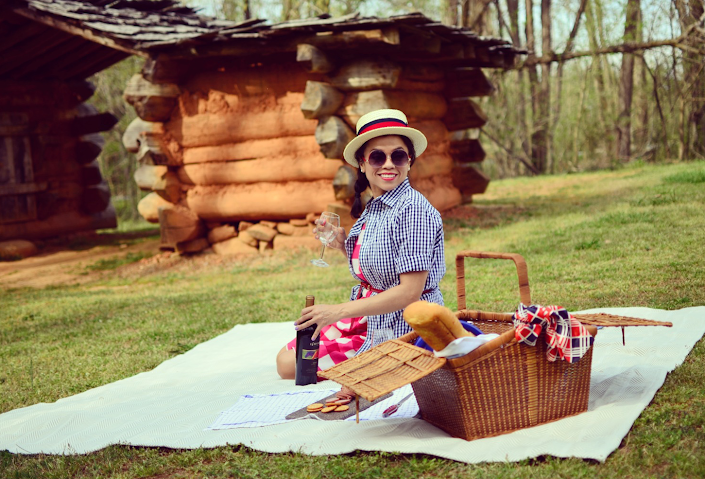 Last week we decided to picnic in Bethabara Park in Winston Salem, NC. It's an adorable area with a lot of Moravian history and great trails for that romantic sunset walk or your early morning intensive runs. 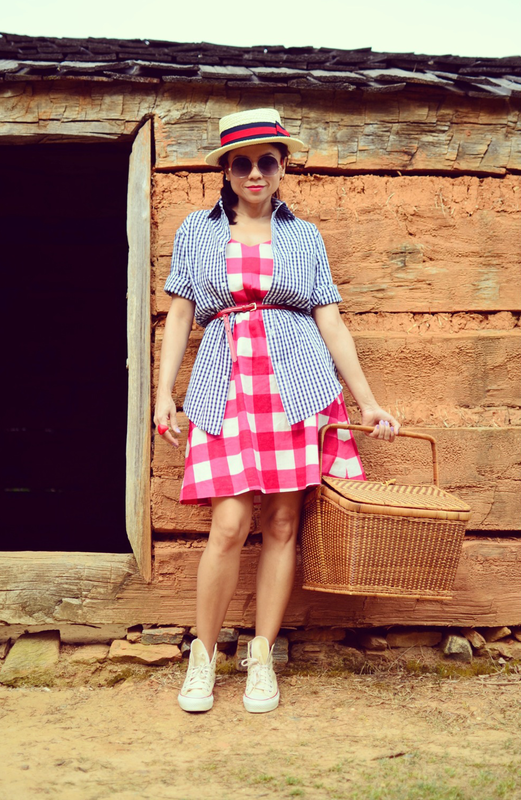 What to wear to a picnic? Well, I decided to wear my classic boater hat (HERE), a gingham dress and since the weather can turn out a little bit chilly during dusk...I wore a gingham shirt over my dress. I really love the way the big and small plaid looked together. My Converse vintage Chuck Taylor has become a must every time I go for outdoors picnics since they are comfortable and chic. Ahhhhh, La temporada para los dias de campo llegó!!!! Traiga su manta, canasta, aperitivos y bebidas favoritas y disfrute la tarde en el campo. La semana pasada nos decidimos ir por un día de campo al Parque Bethabara en Winston Salem, NC. Es un parque adorable con mucha historia de los Moravians y caminos perfectos para una caminada romantica en la puesta del sol o para ejercitarse en la mañana. Me decidí ponerme mi sombrero de varquero y vestido cuadriculado, ademas me puse una camisa de cuadros pequeños en caso de que el tiempo se pusiera un poco frío con la puesta del sol. 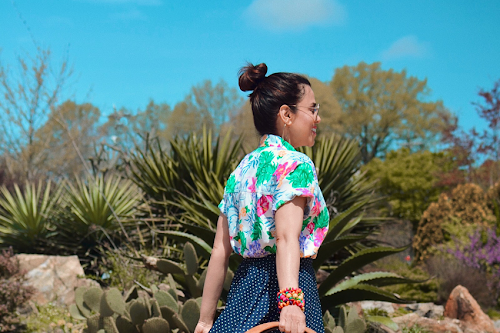 Les digo que me fascinó como quedo el conjunto combinado con dos piezas cuadriculadas. Y por supuesto tengo que mencionar que mis Converse Chuck Taylors no faltan cuando voy al campo para pasar un día relajado. Son prácticos, cómodos y estilosos que dan con todo. Dress/Vestido: Gap. Also worn HERE. Shirt/Camisa: Target. Also worn HERE and HERE. Hat/Sombrero: Scala via Charleston, SC Market. 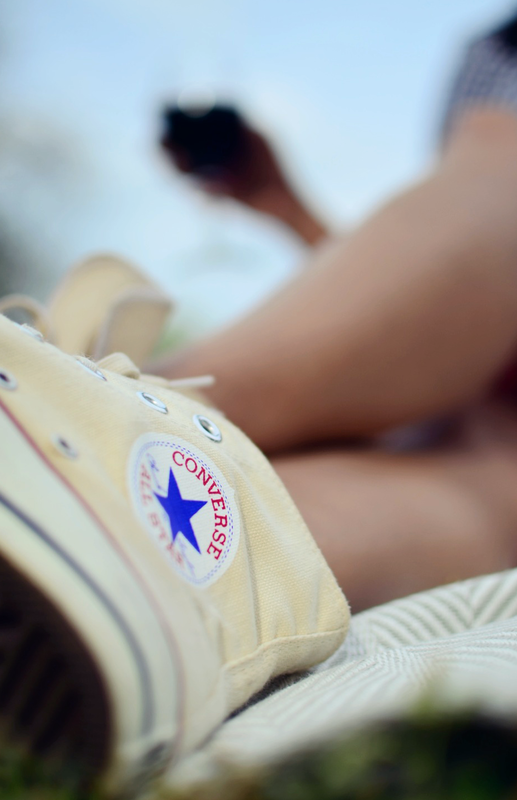 Sneakers/Zapatos de lona: Converse vintage 1970's. For the new version info HERE. Hey Carelia!!! Just saying Hi. I am following you via bloglovin', and I'm sad to say that your posts have not been showing up in my bloglovin' roll. So sorry, I've not checked in on your blog lately. I will subscribe by email to be sure to get your posts. You look adorable today, but then you always do my friend. 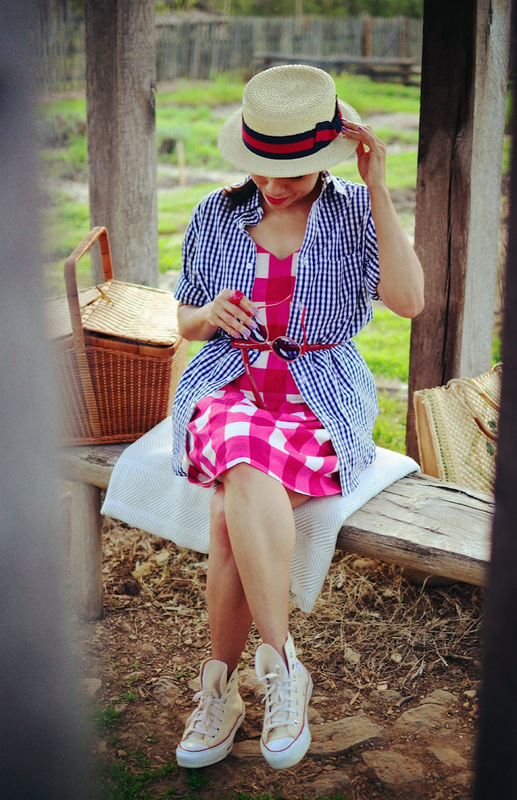 I love the large check gingham dress. I have some large check gingham in blue and I am planning on making a dress with the fabric. It's so nice to see your outfit as it gives me some great ideas. 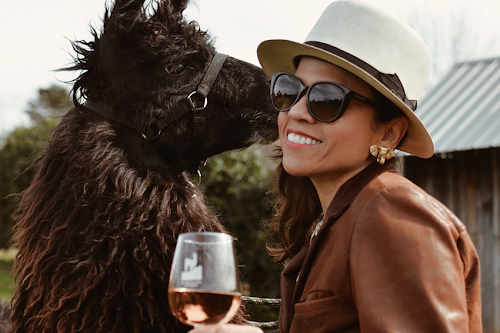 I love your straw boater too! All so perfect for a picnic. Awww Sue, you are so kind for letting me know. I did not know about bloglovin not updating my posts to subscribers. I will check it out. Your comments are always welcome and appreciated. I'm inspired by your style. 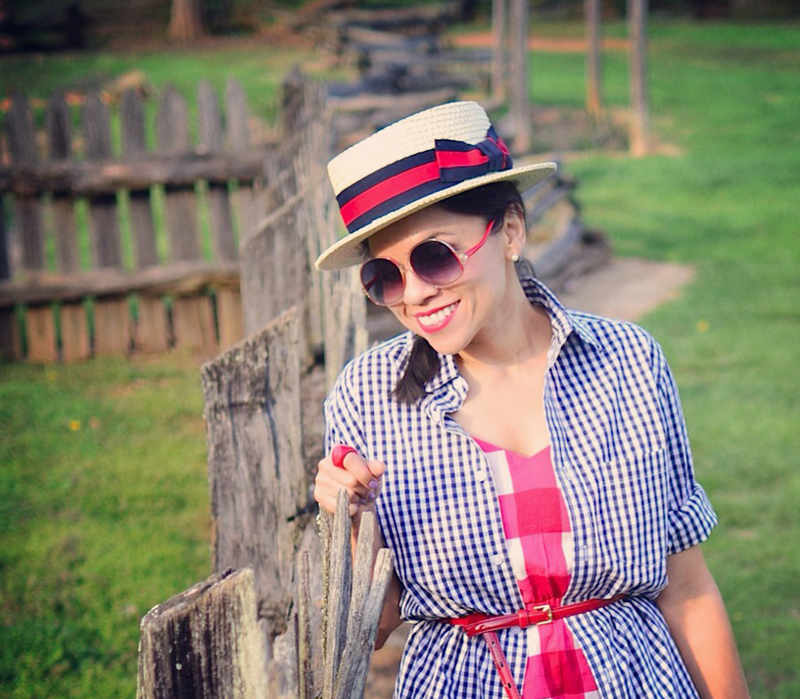 Gingham is the best print for any outdoorsy event. Thanks so much for your comment. I am glad I helped inspiring you. 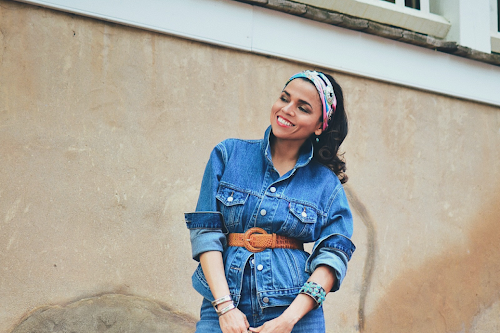 You are absolutely stunning in those vintage chucks. I'm smitten. Your significant other is a great photographer and fortunate to have such a lovely subject.